In the past, fundraising used to be a simple and easy process. You’d give spare change to a fundraising collector on the street or send a cheque in the post directly to your chosen charity. But the evolution of digital technology along with the growth of the internet and mobile technology has led to significant changes in the donation process. Instant donations can be made by SMS or mobile wallet payments, monthly direct debits can be set up online and the need for a signature to confirm a donation is a thing of the past. Technology has revolutionized consumer engagement and product development in the retail, finance and travel sectors, but it seems the charity sector is falling behind with adopting digital technology as well as navigating generational shifts. In the UK alone, 50% of charities don’t have a digital strategy in place according to a new report by Skills Platform and only 9% have been through a digital transformation process. In addition, half of the charities say that other organisational challenges are given more attention and digital is not seen as a priority. New nonprofits are slowly emerging and individuals are now able to find charities that are more in line with their own specific interests as opposed to larger, traditional charities. These niche organizations are well versed in digital best practices and will often have the upper hand when it comes to product innovation and data analysis. It’s crucial that non-profit organizations optimise accordingly when moving processes online in order to reach new audiences and achieve transformative results. According to a study by Charity Checkout who surveyed 500 recently registered UK charities, only 60% had websites, of which, 45% were mobile responsive. Furthermore, 62% of the charities did not have a regular giving option within their online donation platform – clearly missing the opportunity for potential regular donations. Nonprofits that truly wish to develop successful online fundraising campaigns, need to take the necessary steps to implement a responsive website in order to engage their target audience on the device they’re comfortable browsing on. Organisations that fail to understand and adopt the most up-to-date mobile optimisation standards run the risk of high bounce rates and lower conversion rates. But a successful charity campaign doesn’t just stop at a glossy looking website – the user journey is just as important. Unlike eCommerce sites were largely undecided users browse many products and categories, users that land on a charity website are primarily looking for two things – how to donate and additional information about the charity and its cause. With 1 in 3 Americans lacking faith in nonprofits, providing clear and accurate information about your charity – including how and where it operates – should be easily accessible on your website. Making your finances publicly available is a canny way to improve transparency, develop trust and encourage donations. MacMillan Cancer Support does this effectively by offering a breakdown of their annual spending so potential donors can see exactly where their donations are being spent. 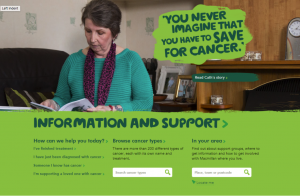 As one of the UK’s top 10 charities, its website provides a wealth of in-depth information and support for cancer suffers and their families including a database of cancer types and treatments, as well as search functions for local support. This ultimately makes it a go-to resource as well as a platform to make donations. Charity: Water’s homepage makes donating simple and easy by providing clear ‘donate’ and ‘fundraise’ calls to action in the top navigation, as well as using a motivating and positive tone of voice to encourage donations. 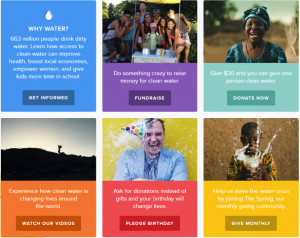 The site also allows users to donate in a variety of ways including setting up a customized fundraising campaign, monthly donations and even a birthday pledge where users can ask for Charity: Water donations rather than gifts. Even optimising your website by reducing donation form fields, optimising calls to action and testing donation defaults can help improve conversion rates and increase your average donation amount. In fact, when the Norwegian Cancer Society redesigned its website in 2012, the charity doubled its online one-off donations as well as quadruple the value of its regular donors in the first year. Like any online business, driving traffic to your organization’s website is essential to increase brand awareness and the number of regular donations. But developing an effective marketing strategy can be difficult for small and medium-sized nonprofits who want to cut through the noise on a limited budget. The Google for Nonprofits programme offer charities and other non-profit organizations – in over 50 countries – access to a suite of free versions of Google’s premium products including, G Suite, Google One Today and YouTube where viewers can make donations directly through a charity’s YouTube video using a donation card. Launched in 2011, the programme also offers $10,000 worth of free advertising per month through its Google Adwords platform, allowing organizations to run paid search ads on Google Search results pages. With $120,000 worth of free advertising per year, this opens up opportunities for non-profit organisations to use existing funds in their marketing budget to partner with digital agencies to manage their paid search campaigns more effectively. Additional funds from Google could also be extended to international paid ads where charities with localised websites can effectively target audiences in new markets. Organisations such as the Royal National Lifeboat Association and US-based charity WITNESS, have had notable success with the Google for Nonprofits programme. In fact, Charity: Water was able to achieve a 350% increase in site traffic, 300% increase in total visitors and a 333% increase in video views within a year of joining the programme. Aside from paid search, social media is one of the main channels companies choose to increase awareness of their brand and for non-profit organizations, it’s often one of the most cost-effective and influential ways to connect with potential donors and supporters. Facebook recently launched fundraising tools featuring ‘donate’ buttons on charity pages and a fundraising function allowing its 343 million European users to easily set up a fundraising page to donate to a charity – all within the Facebook ecosystem. 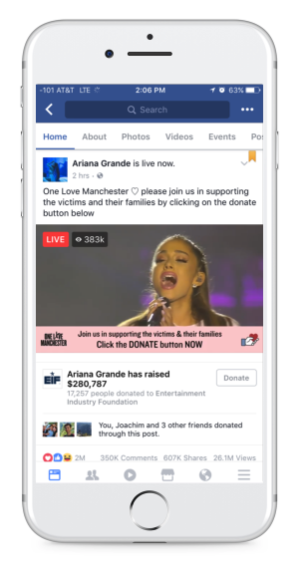 Live streaming fundraising events has the ability to not only bridge the gap between tech-savvy supporters of non-profit organizations but can also be used as a powerful tool to raise awareness of a particular cause to millions of Facebook users. Curating user-generated content through platforms such as Instagram is also a great way to empower your supporters and grow your organization’s online community. Mobilising your followers to share content with their connections can add value to your campaigns as your content is no longer coming from an official channel but through a more familiar third-party endorsement. With the social-political instability of Brexit, the introduction of the GDPR and increased public scrutiny, nonprofits in the UK, EU and US are under more pressure than ever to increase productivity and revenue. Many charity organizations are reaping the rewards of digital transformation, however, an alarming 60% of charities lack basic digital skills, according to the latest Lloyd’s Bank UK Businesses Digital Index. The report peaked the interest of non-profit organisations in the US where 78% of middle-skill jobs – occupations that require education beyond high school, but not a college degree – now require digital skills. While there are many resources and webinars online to help business get to grips with SEO, email marketing, and social media, knowing how all these different channels work together will help your organization develop a better overview of digital marketing and increase your conversion rates. Both General Assembly and eConsultancy provide comprehensive digital marketing courses aimed at developing skills in acquisition, retention, conversion, and optimisation. In many cases hiring a seasoned CMO to develop a digital strategy and oversee a communications team is one of the most common approaches used by charities to take control of their organization’s digital future while building a competent marketing team from the ground up at the same time. Building partnerships with other companies could be an answer to overcome the common issue of small marketing budgets – especially if hiring a CMO is out of the question. Some small to medium sized charities partner with local developers on a pro-bono basis – in order to build the agencies portfolio – while others charities may collaborate to produce a digital product. For example, the Royal Society for Blind Children partnered with Google to develop the Wayfindr app which empowers visually impaired users to navigate their way through London using their smartphones. In order to find success with third-party partnerships, nonprofits should always start by identifying their digital needs or isolating problems they wish to solve and look for partners that meet their needs and share their core values. The adoption of digital technology varies considerably in the nonprofit sector with some organizations using cutting-edge technology while others are relying on traditional, offline approaches. But if nonprofits truly wish to leapfrog ahead in the digital world and engage with new audiences, organizations are encouraged to take proactive steps now or risk stagnation and decay in the near future.